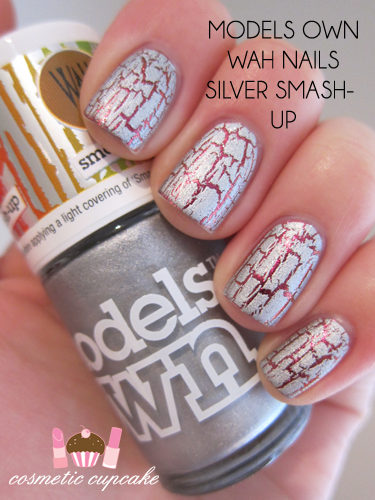 A few months ago WAH nails teamed up with Models Own to create a version of crackle polish with a "graffiti twist" called Smash-Up. I think everyone has heard of the absolute AWESOMENESS that is WAH nails!!! The nail salons seem so fun and they do the BEST designs out there. Plus they are just so darn cool! It’s hard to come by Models Own polishes in Aus and yet again lovely Christina is my polish saviour!!! *happy dance* I decided to layer Silver Smash-Up it over my last manicure using Accessorize Pink Spice. I think Silver Smash-Up has become my new favourite crackle polish. How freaking awesome does it look????!! The texture of Smash-Up is quite unusual and different to others – it has a somewhat gritty finish hence the graffiti twist. It dries to a matte finish and it's super pigmented and very easy to apply. 1 coat is pictured with no topcoat. There is some tip wear in my pics I apologise. I only took these pics after wearing this mani to work! Models Own WAH Nails Silver Smash-Up can be purchased from the Models Own online store for £6. wow this is really lovely over pink spice! HOOOOOOOOOOOOOT! Best silver crackle manicure I have seen yet! Super pretty! I looooove the way it cracked! !~!